Its been a very busy time since I last wrote! So the Megado is all set and working nicely.... and I have a basket of wound pirns. I plan to change the colour every 32-34 inches for a new towel colour. I also wet finished the previous project of book marks and have them all washed and pressed and in the Etsy shop for sale (which is now temporarily shut for my operation). Twelve shaft twill in black 20/2 cotton and a fine linen; sett is 50 epi. I have done a lot of tidy up in the studio. Put yarns aways, finish up sample records, and got a new clear plastic storage bin for the recent tapestry yarn purchase. What else can I do while recovering? Well, when the time comes ... I can sit and wind a warp or three and so have one planned, complete with cones and notes all ready to go. .... and the back edge. I don't think the loom was even cold yet and the next warp was beamed on! It was threaded and sleyed PDQ as well. Then she was hoisted up onto her crates and the tie up done. I'm not likely to be able to weave on this loom for a time but its nice to know its ready for when I am. 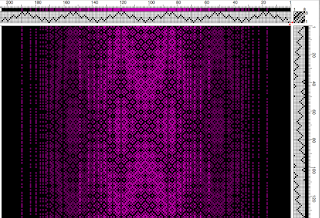 The warp is for two scarves and one will be woven "as drawn in" and the second will be woven "network twill style". In fact the warp that is waiting to be wound on the warping mill is for another set of two scarves, woven the same two ways as well. Different colours of course, but I won't have to change the tie up for a time. I sit on a low stool to do that and I'm not sure my new knee would like trying to get up from that until its well healed.... so I'm being kind to my future self! Anyhow, here's the start of "as drawn in" as a tease.... and there will be a more full disclosure much later on. So that means everything is done and ready in the studio for my eventual return. In the house I have been busy too! We have completed the last of the medical visits and tests. We picked up all the equipment necessary at the Red Cross loans cupboard and our guest room is full of walkers, bath bench, raised toilet seat, crutches, a bed assist bar, another frame device to lift and keep the blankets off my knee, and my new cryo-cuff machine! You place water and ice into the 'cooler' and a quiet little motor circulates the water via the hose to the pad which is wrapped around the (cloth covered) knee. This helps reduce swelling and inflammation. We tried it out today as a trail run and it worked fine and no leaks. You can barely hear the motor! 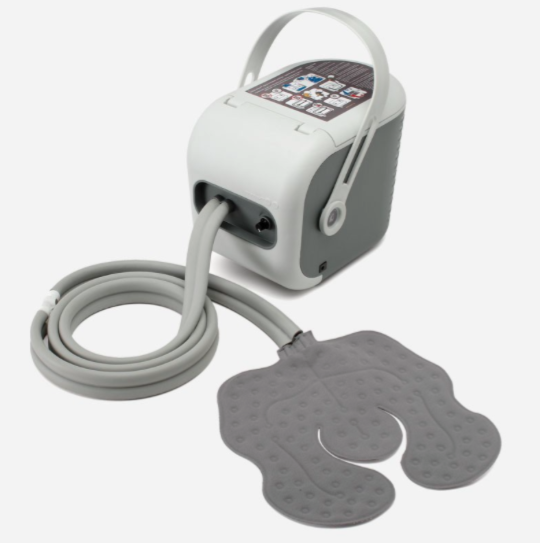 I wish I had known about this gizmo for my hip surgeries! I used leaky doubled bags of ice in 2001 for my left hip..... and frozen gel packs for the right hip this past December. There are different pad types for different body parts available. What is shown above is called a universal and mine is specific for a knee joint. We have arranged for a ride for me to come home using Medivan transport as our Santa Fe SUV isn't user friendly to get a newly operated left knee into. Even with the seat back all the way, its still high off the ground and there's not enough swing room to get the knee in without doing a bend and a maybe twist. Medivan staff will get me home and into the house, up the stairs and settled into my own bed. That will be my big accomplishment for the day I'm sure! I'm thrilled to not have to worry about the stairs on my first day home! The seasons are changing and work goes on around the house and yard to get ready. Bruce got the snow tires mounted on rims and onto the car yesterday. The higher elevation road between here and my hospital has the requirement of snow tires as of October 1st to March 30th. So he'll be safe on his commute to see me at least! We had an arborist come and assess some dead standing trees on the property that must be cut down before the winter wind storms start as they are too close to the house. They died from the dry spell in the summer of 2014 and failed to revive this past spring. We won't know what has died from the long drought this summer until spring 2016. We also found that our neighbourhood deer have started eating things normally labeled in garden shops as "deer proof", so we need some new plants to add to their buffet.... but most likely next spring. Now all I have left to do is some laundry, and pack my bag to go. I have to report in 7:45 am on Monday. Yes, I'm nervous and wishing I didn't have the week to come ahead of me but I do want to get to the benefits of a new knee which is walking pain free, and weaving again. Wish me luck! Bruce bought me some dahlias from a local roadside stand and I must say that they are simply lovely. A real other world inside the petals.... here are some shots so you can enjoy them too. I'll see you here again soon. I was looking out a window down our driveway and saw the back of a large gray cat sitting on the driveway. It was a very big cat and I could clearly see the ears...... when all of a sudden its entire head turned around "exorcist style" and I found myself looking into a pair of very stern yellow eyes! It was a very large owl.... a very large Great Horned Owl sitting in my driveway! Later on, Bruce found him (or her?) sitting in a tree along the driveway and his presence didn't faze the bird at all. He managed to snap a few pictures. They are also known as the cat owl as they are a sufficiently large enough bird to bring one home for dinner! The neighbour's cats are on their own but I'm more concerned about our little resident rabbit! The markings on its feather blend with the tree bark very well! .......but I just couldn't leave the tapestry loom in a pile of nice lumber on the floor! I cleaned each piece and buffed out some marks with a magic eraser and only found one wood bruise. 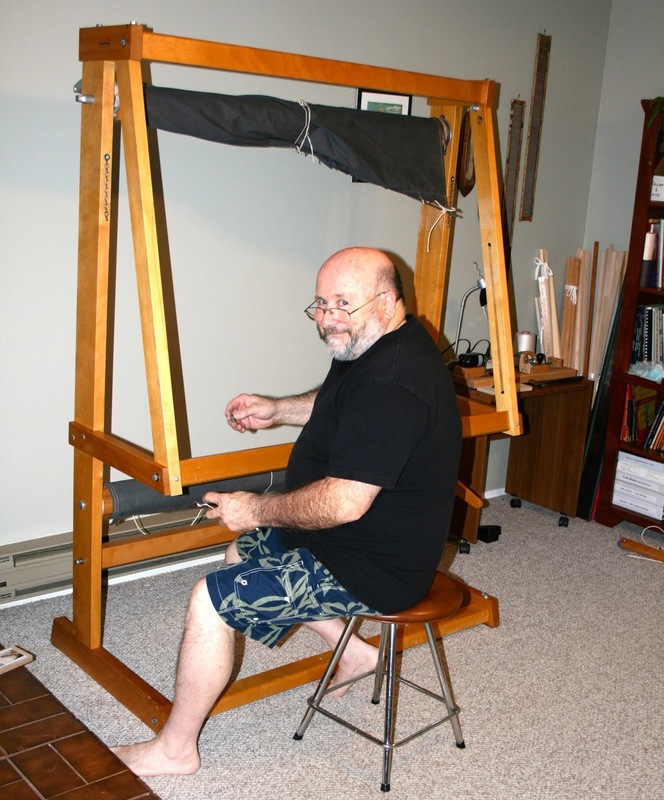 For a loom that's 48 years old, that's pretty darn good! Then using a couple of clear, detailed pictures I found on line, Bruce and I worked hard all afternoon to basically get all the main parts assembled while it lay flat on the floor. So, a fresh start again the next day. We were able to loosen off some bolts and squeak in the parts and then tighten it all up again. It would seem that 95% of the parts need to be set between the two main sides and then all tightened up together. Its a two person job provided they have six pairs of hands to hold everything in place and tighten things up at the same time! It had been a tough two days fighting with parts! Two full afternoons of intense togetherness and no fighting or barking at each other.... cool huh? There she is! All done and a light polish applied and cords secured. Bruce says that if we ever move, it can be well wrapped and go out the door as one large object! 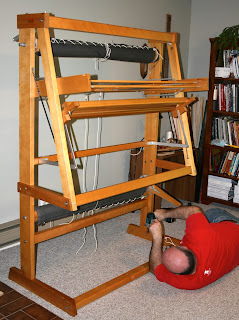 Now the loom can sit and wait a while for me.... and for the yarn to arrive. Which two days later, a large and heavy box arrived on my doorstep! 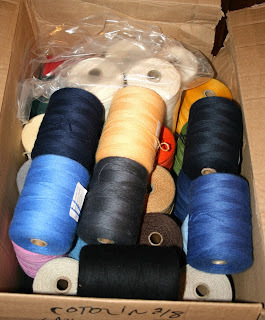 I had placed an order with Brassards in Quebec for some wools, cotton seine cord and some 2/8 cottons. It was a satisfying box load! Two different gauges of cotton seine cord for warps on the Tissart. These are the Blue Mountain wools.... 2100 yards per pound, in twenty eight colours. I need to get a storage bin for them right away. Its a finer wool that I will use doubled. Replacements will be bought as two pound cones as I see what colours I tend to favour. These are the 2/8 cottons. I have a hodge podge of other colours so hopefully this will help expand the selection for project planning. I hope to do some more plaids and tartans eventually. So I'll be reading up on tapestry techniques and planning on a beginners sampler. Ah, all that and reading up on how to beam a warp on the Tissart too. Fortunately there is a good post on line to refer to. I'll even check You Tube just in case.... they seem to have everything there! I'm working on the set up of this loom first as its the one that will be easiest for me to use at some point in my recovery. 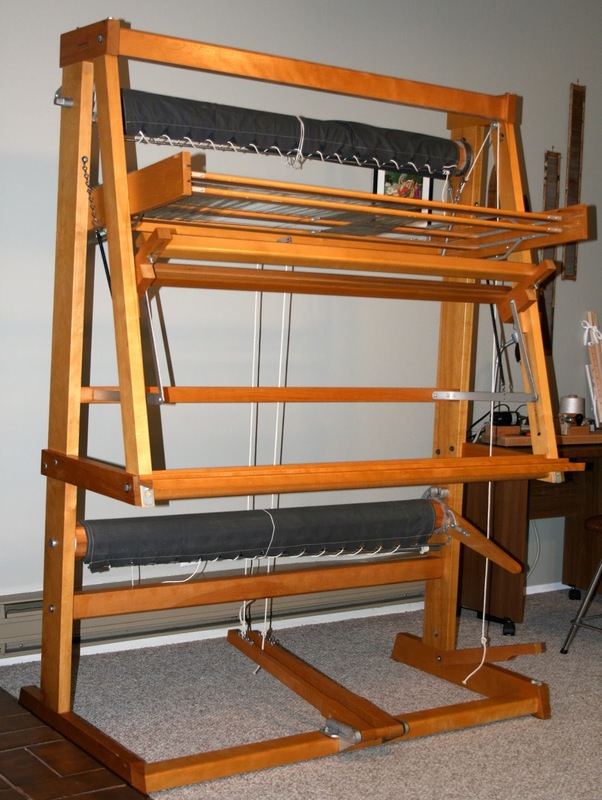 There is just the one treadle and its very light to move. I also bought some springs to attach to the loom to reduce the inertia required to treadle. They are for weavers with joint issues. A smart idea! See the black springs between the cup hooks? That the extra lift and you can set the tension by moving to another hook. The computer program does all the decision making so I can focus on just throwing the shuttle and watching the pattern grow. Also, at this point the new fly shuttle might just have to wait for its working debut. I'm running out of time and I still have another loom to get sorted out! 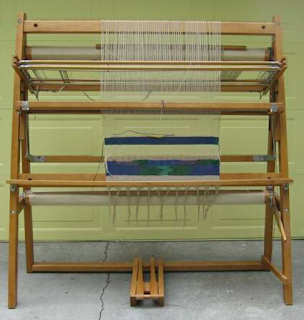 Weaving on the Spring loom has been slow as my knee dictates what I can do and for how long. I've been using my (soon to be replaced) left knee and leg as much as possible to treadle the huck lace by way of 'exercise' but by the end of a session, its tired and very sore. 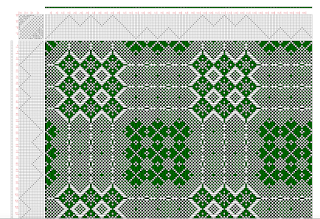 I finished weaving my planned towel number twelve yesterday and yet I can still see warp enough for another. So I will get busy with my bonus towel with its five rows of hemstitching! I would like to get this warp done and off and then prep the towels ready for hemming. I thought I could hand sew the hems while recovering. 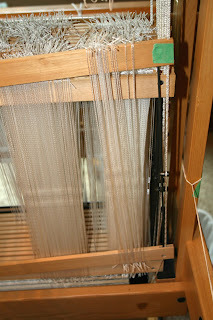 I have a tencel scarf warp to beam on next (see the last post) and it shouldn't take long to thread. I won't be able to maneuver too well so I'd like to get the loom up on her crates and get the tie up done ahead of time. I have two weeks to go but there are several days where I'll be visiting Doctors and pre-admission clinics and doing personal errands to get ready. In between I'll be in the studio! Its been a strange summer. Long, very hot, and very dry. We had no rain for 120 days and then this past week or so we have steady downpours, and its been downright cold. Fall seems to have arrived overnight. We're happy to have the forest fire risk diminish and more water in the creeks again! I have been puttering around and not really pushing myself too hard. My knee is very sore and so some days it simply hurts to stand, let alone weave. That has given me time to look around my studio and decide what direction I'm going to lean. If you read my previous post, then you know that I have been through lots of changes before. 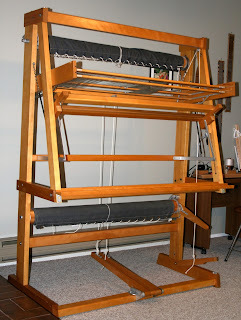 I have wound two scarf warps in tencel for the Louet Spring loom. I plan to warp up this one (below) ahead of my coming surgery so its there on the loom to catch my eye and encourage me along with my physiotherapy. I recently learned to do colour gradations using the Mac version of Fiberworks and I must say they sure do transition nicely. 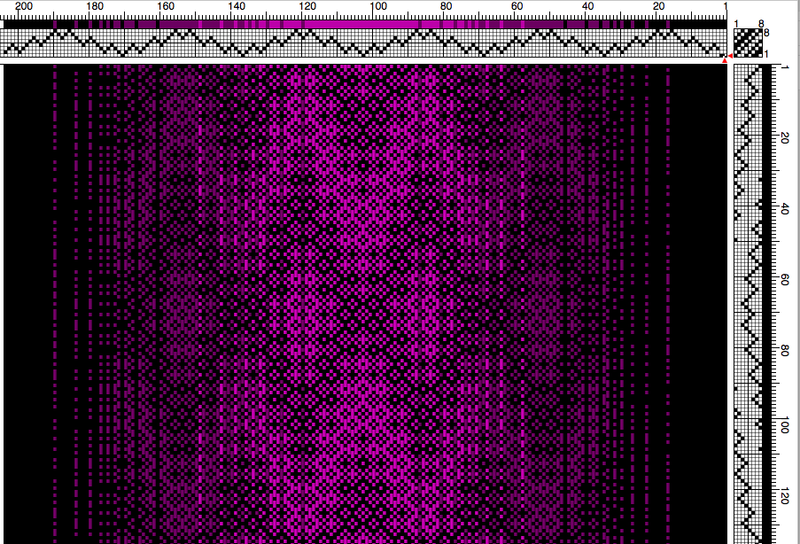 (PC users will get this feature in the next program upgrade) I've used black, eggplant and red purple here. It may be some time before I'm able to treadle this loom so the colours are my carrot! 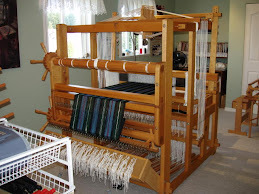 The loom that will be easier to use first, when the time is right, will be the Megado and I have wound a twelve yard warp of simple natural 8/2 cotton and it will be ready to weave towel yardage. It has just the one treadle and I can use my good leg. The computer will do the bulk of the work. I've got some attractive sixteen shaft drafts cued up and it will be fun to watch the patterns grow. I'll use coloured cottons and cottolin's as weft. I'll be beaming that warp later on today. 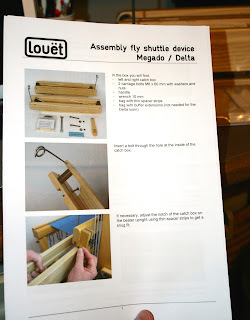 The fly shuttle arrived from Louet in Holland and as usual it was extremely well boxed and presented. You basically take it out and bolt it on. Very little to do other than set the length of the pull cord. I had to take the beater bump blocks off and replace them with new larger ones so the right hand shuttle box doesn't clash with the computer interface. That was four screws. Here they are installed on the loom. 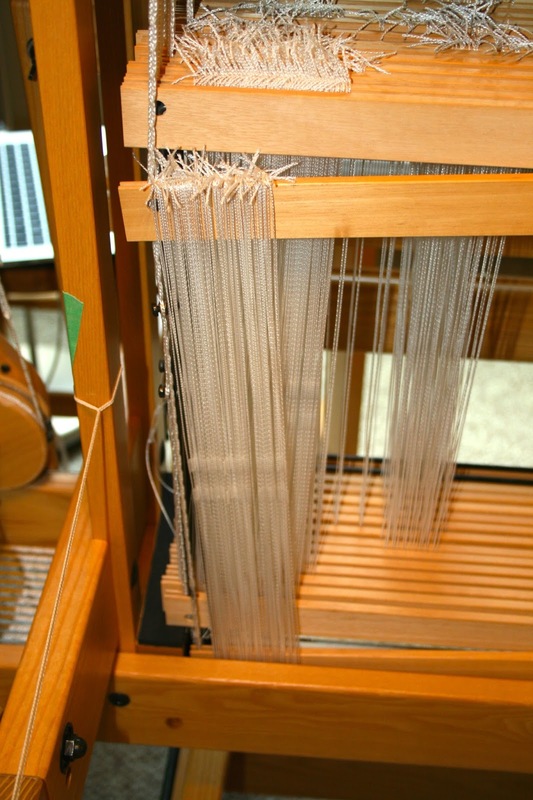 There's no reed in place or front breast beam as I'm preparing to beam a warp. We turned the loom slightly so the boxes don't face any windows! I don't want any damage done to a twenty five hundred dollar patio door! I also placed red and green ribbons on the ends to catch the eye as you move in the room as my "port and starboard markers". There's a problem though. The right hand flyshuttle box slides beautifully.... the left side, not so much. Its stiff and hard to move. I've been emailing to and fro with Louet on this issue. If a solution isn't forth coming soon, then I will take them off and use it by hand. I'm sure it will be resolved eventually. Edit: things seem to have been resolved nicely..... Susan August 4th 2015. The Louet end delivery fly shuttle is huge! Its fifteen inches long and heavy, with rollers underneath. It came with wooden pirns. I was additionally motivated to move the loom when I felt that bruiser and realized all the tips I had received about not pointing the fly boxes at glass were good ones! I guess keeping your feet out of the way too would be a another. Another change is that I decided to sell the Louet Jane table loom and stand as it was not being used. Its been to one workshop and had one other warp on it. That's it since 2008. I find table looms too slow and so tend to use the floor looms instead. It sold right away and it was delivered to its new home today. I'm taking down my warping board centre which isn't being used any longer since I bought the warping mill. It would be a very long time before I could stand to use one again anyhow. 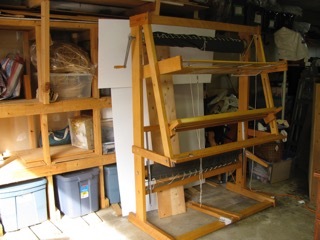 Its been put away and there is a nice sized space next to wall where the loom will go. The new more open look to the studio will still be there and I can work seated at learning samplers on the loom. I'll try to get a warp on her soon, but I have to see what state she's in and if she needs new bits and pieces first. Leclerc doesn't make them any longer but they still have parts. Her name will be Gudrun, after my friend. She had one too and so has inspired me to get busy following my heart as I always wanted to give tapestry a try. If its not for me, then she can be sold and moved on. I won't lose anything, including money, for the effort! I will start with the basics and follow an online workshop and also review my notes I have from a tapestry class that I took with Gudrun. I'll be a newbie again! So a lot of changes, some small, some big and some new directions. The driving force behind much of this is coming to terms with the reality of my joint issues. I *will* be able to floor loom weave again but I'm looking for easier options for my health. They can replace the joints but the Arthritis Lupus will never go away. So, time to adapt, make changes... and move on. I hope to get another post done before my surgery on September 28th. Any posts after that won't be weaving related but I'm sure you'll understand. I will admit to being very nervous and I hear its more painful than a hip .... and that was bad enough! So getting things in order in the studio will be my distraction during the coming days. Night time though, insomnia has my Mind in full play! I reason with myself that it will result in a better, more mobile me in time, but the Mind is having none of that argument!